Kosovo has marked the first anniversary of its unilateral declaration of independence from Serbia. Parliament in Pristina held a special session at 1100 local time - the hour at which the declaration was made - while thousands celebrated outside. Prime Minister Hashim Thaci said it had been "a year of historic success". Serbia still refuses to recognise Kosovo and correspondents say parts of northern Kosovo remain tensely divided between ethnic Albanians and Serbs. MPs from the Serbian parliament in Belgrade attended the assembly set up by the Serb minority in protest at Tuesday's celebrations. 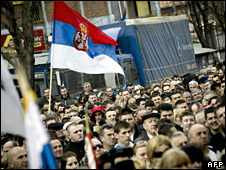 Ethnic Albanians constitute 90% of Kosovo's two million people. Kosovo's unilateral declaration of independence last year has so far been recognised by only 54 of the UN's 192 countries, including the US, Japan and all but five of the 27 members of the European Union. 54 of the UN's 192 countries and 22 of the 27 EU member states have recognised Kosovo's independence. Serbia, backed by Russia, has refused to recognise the declaration and has challenged its legality at the UN's International Court of Justice. In a BBC interview, Kosovo's President Fatmir Sejdiu said he expected other nations to join those who had so far recognised its independence, even though the government was not yet in control of all of its territory. "Kosovo's independence represents the most rational step of its own time, as it gave its people the chance to live in freedom and peace with its neighbours, and aspirations to integrate into the bigger European family," he said. Mr Sejdiu said Kosovo had paid particular care to safeguard the rights of minorities and wanted to be the "fatherland for all its citizens". As parliament held a special session on Tuesday morning, Prime Minister Thaci told MPs that this was the "biggest and most important holiday for the people of Kosovo". "The year we left behind was a year of achievement and of pride. It was a year of historic success for our country," he said. 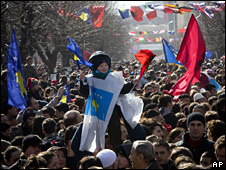 Outside, thousands of people gathered to mark the anniversary, many waving Kosovo's new flag and banners saying "happy birthday". For ethnic Albanians this is the chance not just to celebrate but also to remember those who died fighting for independence, the BBC's Helen Fawkes in Pristina says. The Serb population, however, is ignoring the anniversary - for them, Kosovo's breakaway from Serbia was an illegal act and it is still part of Serbia, she adds. Albanian leaders say the Serbs are being constantly encouraged by the authorities in Belgrade to boycott and reject any offers coming from Pristina. On Tuesday, in defiance of the anniversary celebrations, Serbian deputies travelled from Belgrade to the northern Kosovo municipality of Zvecan, which is controlled by Serbs, to attend a session of their alternative parliament. Meanwhile, Serbian President Boris Tadic vowed that his country would never recognise the independence of its former province and would defend its "legitimate rights by legal and diplomatic means, not force". "Kosovo is not a country," he said in a statement. The Serb minority and their religious sites are currently protected by a Nato-led force. Also helping to keep order is the EU's largest ever police and justice mission, Eulex, which deployed in December.